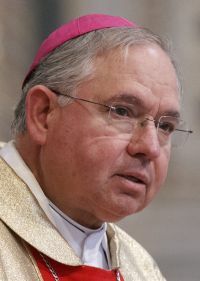 WASHINGTON (CNS) — Archbishop Jose H. Gomez of Los Angeles said in a May 25 statement that a planned increase in federal immigration raids is “yet another depressing sign of the failed state of American immigration policy.” The raids were announced in mid-May. Archbishop Gomez’ comment was echoed by Seattle Auxiliary Bishop Eusebio L. Elizondo, chairman of the U.S. bishops’ Committee on Migration. The archbishop is chairman-elect of the committee. While saying he recognized the federal government’s role in upholding immigration laws, he said the deportations would not be “an effective deterrent” to migration because these “vulnerable populations” are facing a humanitarian crisis in their home countries. On May 24, U.S. Immigration and Customs Enforcement personnel deported a mother and her 14-year-old daughter from the South Texas Family Residential Center in Dilley, Texas. ICE took the action despite knowing that the family was afraid of being killed in their home country, that their asylum claim had never been heard, and despite knowing that attorneys had requested a stay of removal and were in the midst of filing an appeal, according to Katie Shepherd, managing attorney for the Cara Family Detention Pro Bono Project, which provides legal representation and undertakes advocacy on behalf of mothers and children held in federal family detention centers. According to Shepherd, ICE also knew that attorneys had requested a stay of removal for the family and were in the midst of filing an appeal. “ICE swiftly deported the mother and her child, informing counsel only after the fact. It is outrageous that, knowing that her appeal was in the works and that she had expressed a fear of return, ICE chose to hustle the family out of the detention center in the dark of night and put them on a plane before the courthouse doors opened,” Shepherd said in a May 25 statement. “Just like in January, we are seeing mothers and children who are confused, disoriented, and terrified for themselves and their children,” she added. In January, Bishop Elizondo and Bishop Kevin W. Vann of Orange, California, chairman of the Catholic Legal Immigration Network, wrote to Homeland Security Secretary Jeh Johnson about recent raids that had netted 121 undocumented immigrants in a three-day span, many of them mothers and children. CLINIC is one of four partners in the Cara Project. The others are the American Immigration Council, the American Immigration Lawyers Association and the Refugee and Immigrant Center for Education and Legal Services. “This family is just the latest in the string of lives destroyed by a government that refuses to administer our refugee protection system with the care it requires. Sadly, ICE’s harsh enforcement tactics will put many more vulnerable people at risk,” said the Cara Project’s Shepherd. Bishop Daniel E. Flores of Brownsville, Texas, also issued a statement May 25 about the new wave of deportation raids. Over the past year or more, the Brownsville Diocese, which is in the Rio Grande River Valley, has had an increase of immigrants with numbers as high as 200 on some days. Mostly from Central America, the immigrants receive help at the diocesan respite center at Sacred Heart Church in McAllen at continue north to other states. Michelle Mendez, who represents some clients for CLINIC and does training and legal support as well, also moderates a closed Facebook page for women who were detained. Introduced just last October, the group, she said, now has 750 members. On the page, “we give them guidance on the removal proceedings,” Mendez said. “They have a lot of misinformation or lack of information. They think that reporting to ICE on a monthly basis is the same as going to court. Or that changing your address with ICE is the same as changing your address with the court.” Neither is true, she added, and some women have been tripped up by this false belief.